Oddball Films presents Vintage Halloween Hullabaloo, a program of vintage 16mm films to get us in the mood for All Hallows Eve with cartoons, ridiculous educational films and made-for-tv terrors. Di$ney teaches us the history, mystery and danger of this ghoulish night with the narrator from the Haunted Mansion and his classic cartoon pals in Di$ney's Haunted Halloween (1984). 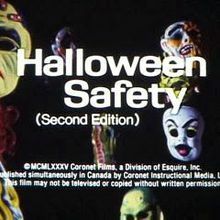 Trick or Treat (1969) tells the story of four boys and a ‘trick’ on Halloween that leads to serious damage and injury. 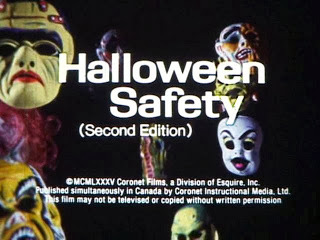 Halloween Safety (1985) gives us valuable lessons about awesome robot costumes, horrible face makeup and of course, tainted candy. TV's original Joker, Caesar Romero haunts a rundown mansion while teaching you all about dental hygiene in The Haunted Mouth (1974). Joseph Cotton narrates a loving overview of some of the silver screen's most horrific creatures in Monsters We Have Known and Loved (1964). With a rockin' musical break, featuring some interpretive-dancing spectres in an Old-West ghost town from John Byner's Something Else (1970) and the ridiculous cartoon Spooky Boos and Room Noodles (1970s) that flat out lies to children, so they won't be afraid of the dark. Plus, a coffin full of Horror Movie Trailers, Sweet Treats, Scary Surprises and a Ouija board for pre-show haunts! Using a poorly animated Jack o’lantern and the simplest English possible, the perils of All Hallows Eve are trotted out to teach kids that there’s no way they’ll be safe without a grown-up. Designed to insult anyone over the age of 4, this gem will have you reaching for a razorblade apple in no time. Pete's cowboy outfit is too small now. He has really outgrown trick-or-treating. But his pal Sandy has talked him into one last fling. Pete's dad extracts a promise that the boys will commit no mischief, and things just get worse from there. And how! Veteran actor Caesar Romero stars as “The Spectre of Plaque” in The Haunted Mouth, an oral hygiene scare film produced for the classroom by the American Dental Association. From the short lived TV series “Hollywood and the Stars”. Narrated by Joseph Cotten, this half program examines the famous and bizarre creatures that have graced the silver screen, including some rare out takes from films such as the original “Raven”, “Nosferatu”, “Frankenstein”, “The Black Cat” and many more. Goofy learns the history and traditions of All Hollow’s Eve and some of the modern-day dangers he might face on this creepy night, all illustrated by classic animation from the ol’ mousey studio. Also contains some live action and scenes (as well as the spooky narrator) from the Haunted Mansion. In a rockin' spooktacular clip from this eclectic musical variety show, the Action Faction dancers don ghoulish garb and get down in a ghost town. These whirling ghosts will get your hairs on end and your feet a tappin'! Have you got monsters in your room at night? Don't worry, the room noodles will tickle them into submission! This cut-out cartoon short aimed at assuaging children's fear of the dark doesn't bother explaining any facts, it just relies on lies and "room noodles" to get the job done. I guess imaginary monsters require imaginary foes.